It's no secret that I'm an advocate for white + minimal websites, but that's not everybody's cup of tea. However, it's all the rage to have a clean and simple website, which can make it tricky to add in color correctly if you want more pizzazz in there. One solution to this is adding in different color banners on your website. The other benefit to adding in the banners is they offer a clear + pretty way to divide up content. What does that mean exactly? See below. The different background colors are the banners (also please note I'm aware I'm here pitching color and the banner colors are grey and less grey. I just can't help myself). Watch my swanky + simple video below on how to create a banner and set it up in Squarespace. 1. If you found this help and would like more videos like it, let me know. 2. Is there a Squarespace sprucing tip you would like to me to cover let me know in the comments below? 3. 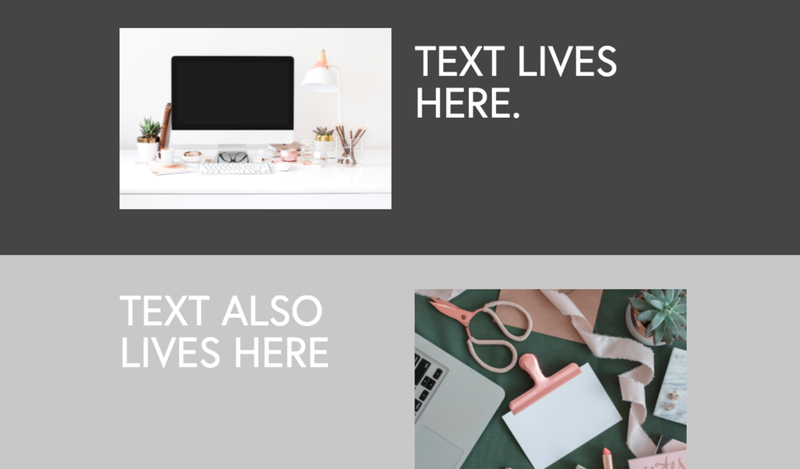 If you want instant gratification for more Sprucing suggestions, click the button below for my favorite tools + resources to Spruce yo Squarespace. Also Happy Thanksgiving week! I sure am thankful you're here.